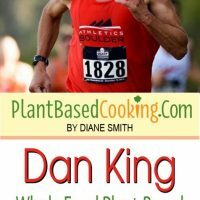 When Boulder, Colorado-based international champion runner Dan King turned the big “Five-O,” making the switch to a whole food plant-based diet was a no-brainer for a man who’s been running competitively since high school but has really hit his stride since going plant-based nine years ago. King’s athletic performance has been nothing short of stellar and he’s seen tremendous improvements in his health. 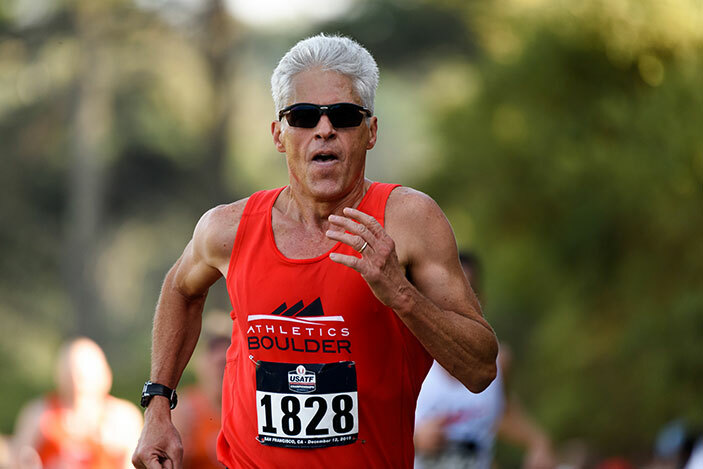 Dan King coming to the finish in first place in the M55 age group at the USATF National Club Cross Country Championships in San Francisco CA on Dec 12, 2015. Photo courtesy, Dan Albo of Lane 1 Photos. “I had a physical and bloodwork when I turned 50 just as I was making the dietary transition. My total cholesterol at the time was 180, and my blood pressure was OK, but not great. Three months later I had to get another physical to support an insurance policy. My cholesterol was down by almost 50 points and my blood pressure went into the ‘best category.’ I was pretty surprised by how much my values on all those things changed,” King said. At 59, King takes no medication but does take a few supplements – vitamin B12 and vegan omega 3’s derived from algae, and vitamin D3 in the winter. “I’ve had some great success, all as a 50-plus-year-old athlete,” King told Plantbasedcooking.com. While King has, as he puts it, “podiumed” (i.e. won first, second or third place medals) consistently in age-group (“AG”) races nationally and internationally since he turned plant-based, he’s perhaps best known for his stint as the “World’s Fittest CEO.” King clinched the CEO Endurance Championships in September, 2012, in Tennessee. Twenty CEOs the top of their fitness game, many significantly younger than King, competed in a three-day, six-event competition consisting of running, cycling, swimming and an obstacle course. More recently, King won first place at the 2015 USA Track and Field (USATF) Cross Country Championships in Boulder, Colorado, and the USATF Club Cross Country National Championships in San Francisco. Also in 2015, King won the 5,000-meter bronze medal at the highly-competitive World Masters Athletics Track and Field Championships in Lyon, France. 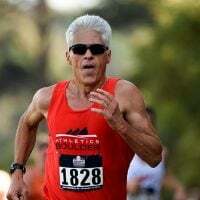 That half-century, 50-year mark was an especially significant milestone for King, a “semi-retired” telecommunications executive, entrepreneur and self-described former ski bum who’s currently working toward a possible career in nutrition. King is the brother of champion runner Laura Bruess, recently profiled in an article on Plantbasedcooking.com along with her husband, runner and coach Rick Bruess. “I also wanted to continue to be a competitive athlete, so I want to eat in a way that enhances my ability to compete,” he said. King described the athletic training process as one of stress and recovery, noting that many athletes don’t fully appreciate the importance of recovery. For some people, overall health and athletic advantage might be enough to justify a plant-based diet. But King is a man with a strong social conscience, and that led to his third reason for going plant-based. “For me, it’s important to make decisions around food that conform to my values, I’m one of those people that would consider myself environmentally minded. I find that the way our society condones animal agriculture in factory farms repugnant from an ethics standpoint and potentially harmful as it relates to health, not to mention ecologically unsustainable,” King said. King was pleased to report that he recently earned a Plant-Based Nutrition Certificate from the T. Colin Campbell Center for Nutrition Studies. The certificate program is offered online through Cornell University. This fall King will continue his studies with nutrition coursework at the University of Colorado. 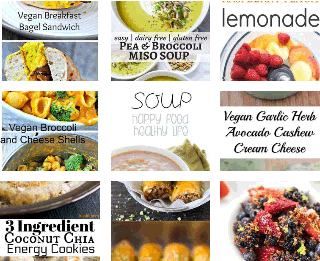 “For me, vegan connotes as much as what you don’t eat as what you do eat. You can be vegan and not be healthy. 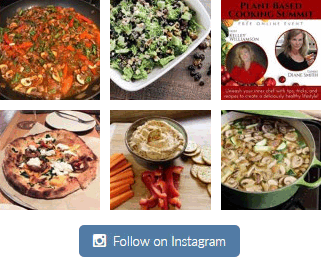 I think ‘whole food plant-based’ better describes what I try to eat rather than what I avoid. 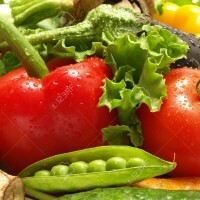 I eat lots of fruits and vegetables, legumes, whole grains, and some nuts. You can eat a lot of sugary, salty and oily processed foods as a vegan that aren’t particularly healthy or performance promoting,” King said. “I often get asked by friends where I get my protein. It’s hard to get away from the protein-focused mindset as an athlete. I’m confident that I get sufficient protein from my regular plant-based diet, but I’ll occasionally supplement with a plant-based protein shake just for peace of mind when I’m training especially hard. My diet probably works out to be about 75-80 percent carbs, 10-12 percent protein and 10-12 percent fats,” King said. King said that he cooks a lot more than he used to because it gives him more control over what he eats. “I go out of my way to avoid added sugars. I don’t avoid but minimize added oils to foods, and try to leave out GMO crops altogether. I have super concerns about those. I eat organic, and supposedly there aren’t GMOs there,” King said. “I’m very evidence-based in how I think and that’s Greger’s approach, what does the science tell us? I say that knowing that a lot of the science that you come across in nutrition in inherently biased from a number of reasons, and you have to be super careful when trying to suss it out – y’know, who funds these studies?” King said. King swears by a podcast by Rich Roll, a plant-based endurance athlete in his early 50s. “Roll interviews super-interesting plant-based people, like cardiologist Joel Kahn and Dr. John McDougall, Dr. Caldwell Esselstyn and his son Rip Esselstyn, and also Dr. Neal Barnard, he’s very compelling,” King said. 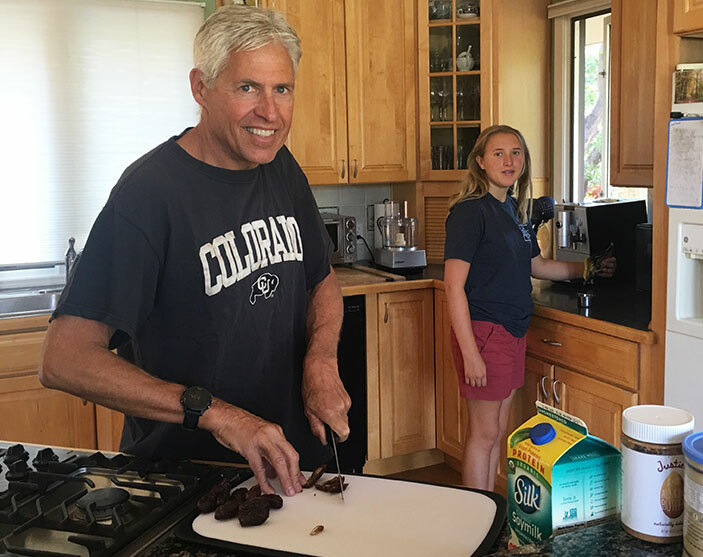 Dan King and his daughter Stephanie cooking in their Boulder, Colorado, kitchen. Photo courtesy, Dan Albo of Lane 1 Photos. “Most days I just eat plain old-fashioned rolled oats with a bunch of nuts and dried or frozen fruit and almond milk,” King said. “One of my favorite go-to lunches are big bowls with quinoa or brown rice and some kind of legume, like black or pinto beans or lentils. Then I throw in a bunch of avocado and salsa on it. I love Latin foods. 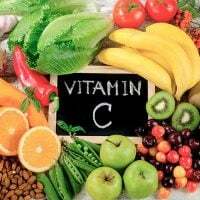 It’s quick and easy and a high-health equation lunch,” King said. “I basically eat what I always used to eat, such as stir-fry veggies with “chicken” and brown rice, fishless “fish” sticks with mashed potatoes, and, of course, big salads on the side. Those mock meats are so good now compared to 10 or 20 years ago, you don’t need to make sacrifices if you want to be plant-based,” King said. King bakes often, including making a sugar-free banana bread each week. His favorite “gooey tasting” brownies are made with almond butter, dates, cocoa powder and chocolate chips and he also loves these fig newtons made with almond and coconut flour. King makes his own cashew cream at home with cashews and a little bit of water in a blender as a substitute for half-and-half. King thinks it’s important to leave the fiber in food. He makes smoothies in his Vitamix blender instead of juicing. “I’m turning 60 next year. I thought would be fun to try to run a 5-minute mile after age 60, so that’s kind of a high bar,” King said. Combine the flour, baking powder, baking soda and cinnamon in a bowl. Stir to blend. Mash the bananas well with a fork or place in a blender and puree until smooth. Add the bananas and rest of ingredients to flour mixture and mix well. Pour into a parchment lined or greased loaf pan. Bake for 40-50 minutes or until a knife inserted comes out clean.